​PART relies solely on the generosity of our family, friends, and donors. 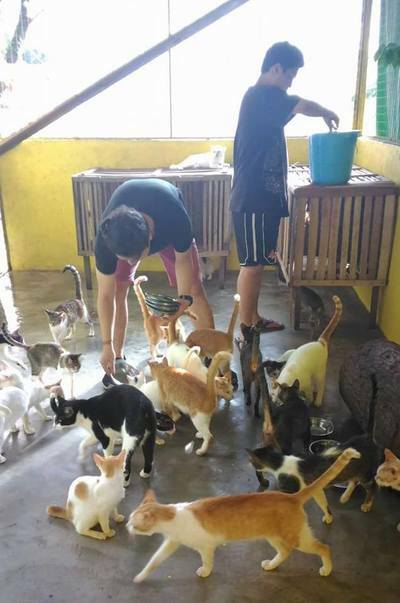 All donations received are used to provide food, medicine and veterinary care for all our rescued animals; and maintain and operate our shelter. We, the PART admins, are all volunteers who also donate money to support our mission and vision. We take pride that our shelter, Paws and Claws Animal Sanctuary (PCAS) is an outbreak free home for the past few years. This is not an easy feat especially for a shelter with hundreds of animals. One of the tools we use is vaccine to ensure that the sanctuary remains healthy and safe for the fur kids. ​Every year PART spends almost 500,000 Pesos or over $10,000 USD in vaccine alone. 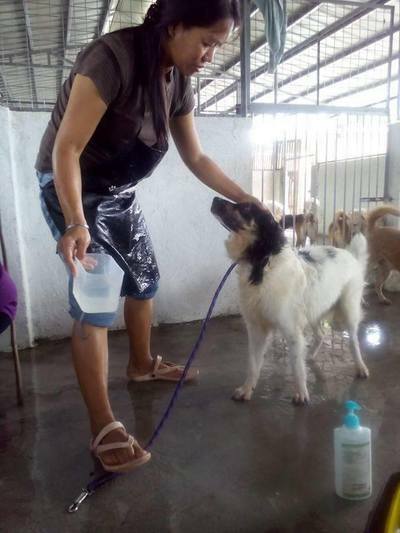 When you sponsor one of our dog or cat's annual vaccine, you help us ensure that our fur kids remain healthy until they find their furever home and that the sanctuary remains outbreak free. For cats, the annual vaccine sponsorship includes anti-rabies, 4-in-1, and deworming. This annual sponsorship is 800 Pesos or 66.67 Pesos Per month. 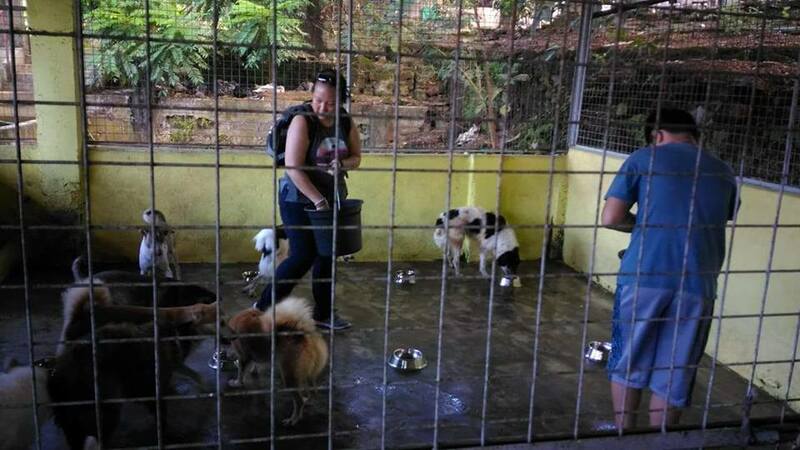 ​To maintain the health of our rescues, PART spends 170,000 Pesos per month in food alone. ​​This amount does not include expenses such as veterinary care, vitamins, supplements, cat litter, bowls, leashes, collars, harnesses, and cleaning supplies. 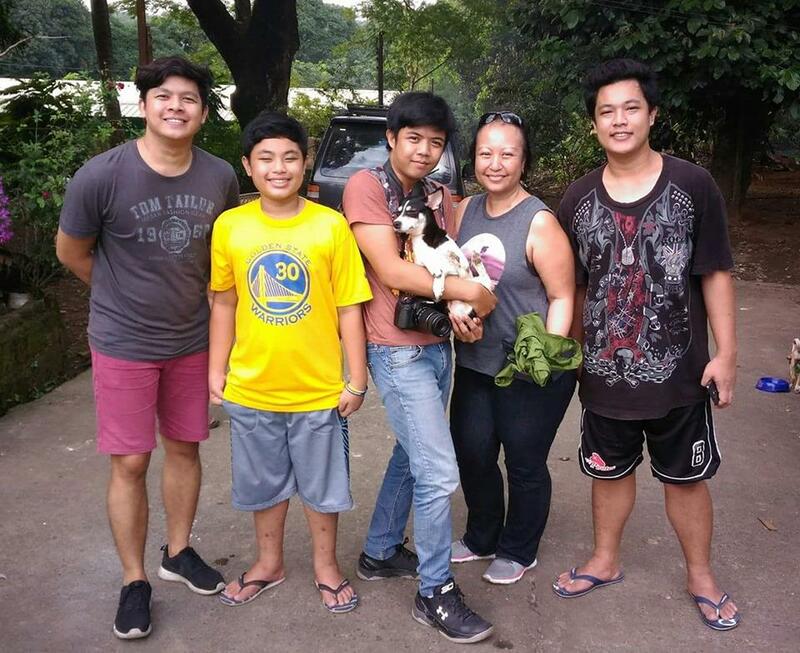 ​Paws and Claws Animal Sanctuary (PCAS) is home to a number of senior and special needs pets who are either blind, lost their legs, has cancer, liver or kidney diseases who has a slim chance of getting adopted. These pets require special care, diet, medicines and supplements. All of our rescue animals require blood work, vaccination, deworming, spay/neuter, and microchip. With your help as a sponsor, together we can ensure that the animal is provided his/her needs while waiting for his/her furever home. 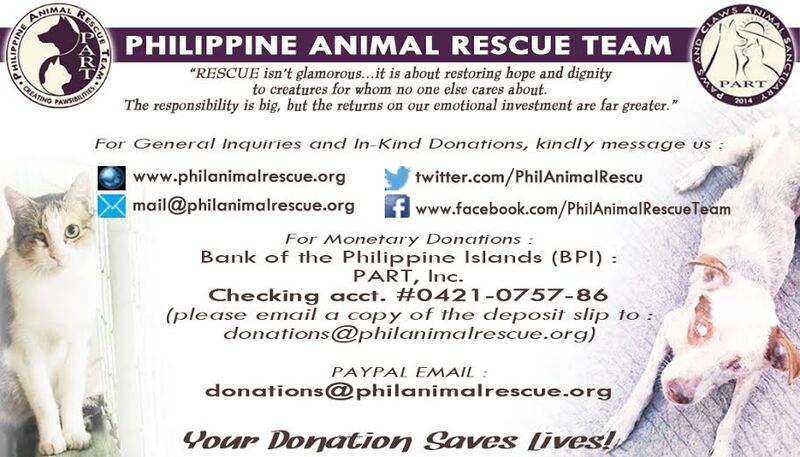 ​Be one of our PARTners and sponsor one of our rescued animals! Unlimited visits during shelter hours, and you can also take your sponsored fur kid out and have a few bonding hours together. Just email us at mail@philanimalrescue.org at least 72 hours in advance. The Phoenix Fund honors the memory and legacy of Phoenix, the cat who was burned alive by providing homeless, neglected, and abused animals a chance to be reborn. The Phoenix symbolizes renewal. Every animal rescued by PART is given the chance to rise through the ashes and obtain a new life through Phoenix and the Phoenix Fund. Funds raised through our Phoenix Fund will be used to pay for the care and treatment of our rescues so that we can continue our lifesaving work of rescuing homeless, abandoned, neglected, and abused animals. Read more. Community Outreach and Rescue Education (CORE) is our educational program. 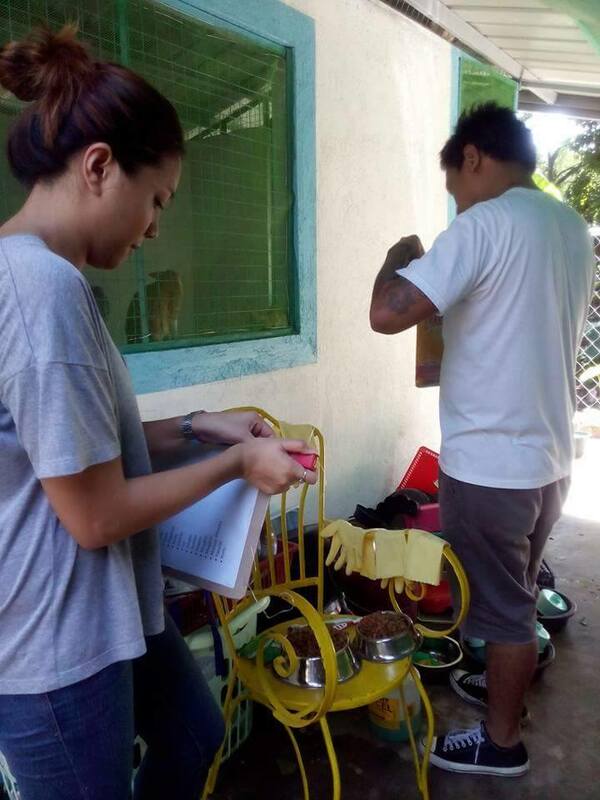 Educating the public is one of the most important tool of animal welfare advocates. Your contribution in this program allows us to cover transportation and educational materials. Read more. Through our partnership we are able to offer our supporters who are US Citizens and Residents to send in their donation for PART and receive a charitable donation receipt. This receipt will allow you to receive a tax deduction for your contribution. 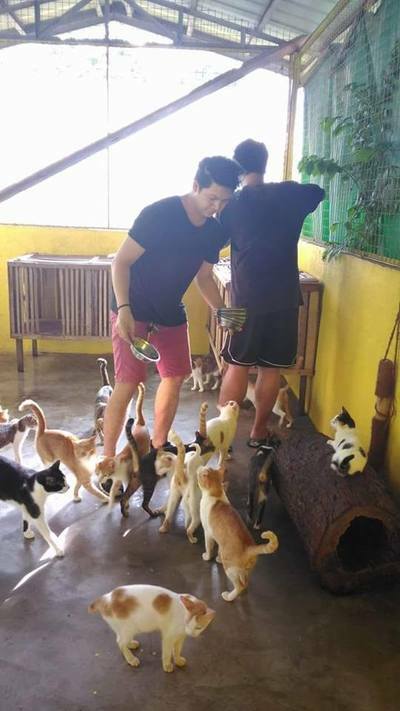 PART is the first and ONLY SEC registered NO KILL shelter in the Philippines. We currently have over 400 animals including dogs, cats, turtles, goats, chickens and turtles. When you donate to PART, 97% of your donations goes to the needs of the animals, 3% goes to paying bank fees or paypal fees. 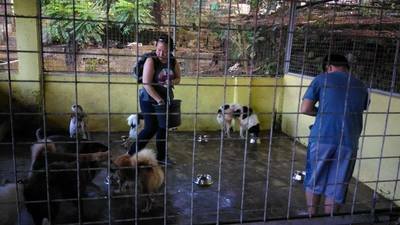 ​Philippines is a country and still has a long way to go when it comes to animal welfare and animal rights. Being a developing country donations are also very hard to come by. For every dollar you donate, you feed a dog or a cat at least once a day . You allow a homeless/abandoned/abused cat or dog a much better chance of survival. To make a donation towards sponsorship of one of our rescues or pet pantry or to ensure that our doors remain open to the hundreds of animals that calls the sanctuary home, please use the donate button below and please ensure you click the MAKE THIS RECURRING to automatically send in your gift monthly. On behalf of our animals, we thank you in advance. ​​In-kind donations are always happily accepted and the following are the in-kind gift options. When you drop off or mail any in-kind gifts, please fill out the in-kind gift form so we can alert our staff and partner vet that you're coming by and issue an acknowledgement receipt for your gifts. ​NOTE: Once a month we announce a designated pick-up location and time so we can collect in-kind gifts for the fur kids. If you'd like to know when the next one is please email us at mail@philanimalrescue.org with the subject "In-kind Gifts". Paws and Claws Animal Sanctuary (PCAS) needs the followung supplies. If you have them but no longer need them please email us at: mail@philanimalrescue.org. Thank you for considering donating to PART. We are always in need of the following supplies. If you'd like to donate any of the following supplies please email us at mail@philanimalrescue.org. We will glady take them off your hands. Thank you. 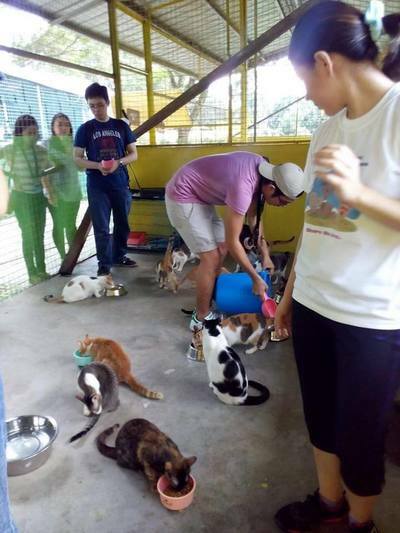 Volunteers are always welcome at Paws and Claws Animal Sanctuary. 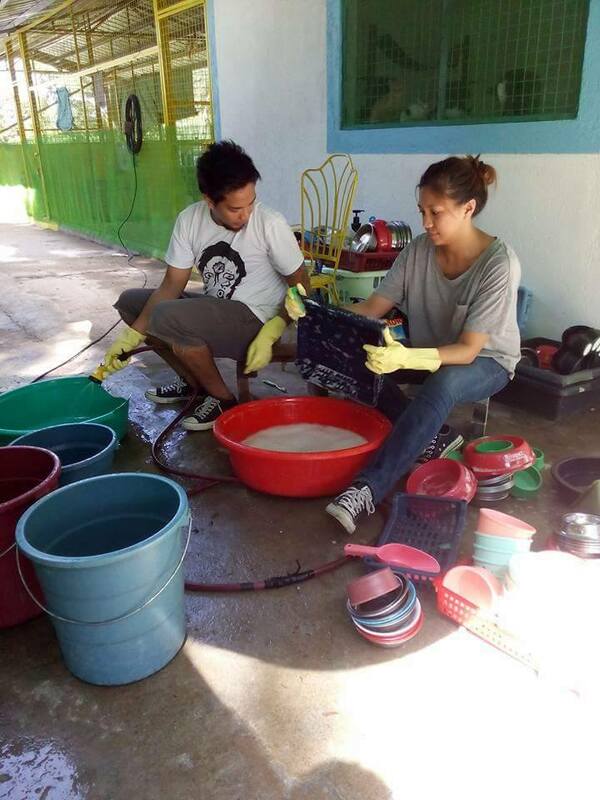 With more than 500 animals in our care, there is always a task that needs to be done. ​Volunteer shifts are available every Wednesday, Saturday, and Sunday. Volunteer shifts are 8 am to 12 noon or 1 pm to 4 pm. With a packed schedule, ALL VOLUNTEERS MUST ARRIVE ON TIME. When volunteers arrive late, it puts us behind schedule. This means our cats and dogs eat late, bathe late, and all the tasks for the day are thrown off schedule. For this reason, LATE ARRIVALS WILL NOT BE ACCOMMODATED. Selfies and photography NOT allowed during your shift.